As is well known, the actin cytoskeleton is a highly dynamic structure, involved in a large number of cellular processes, including muscle contraction, lamellopodial extrusion, cell locomotion, cytokinesis, intracellular transport and many more. Under the tight regulation of more than 50 actin binding proteins (ABPs) and in response to a wide variety of internal and external stimuli, the morphology of the actin cytoskeleton changes rapidly. For more than 20 years now, Cytoskeleton Inc. has provided a large selection of robust and user friendly solutions (pure and active actin proteins/Biochemical assays and actin staining probes..) which have helped many researchers to solve fundamental questions in cell signalling, cytoskeleton and actin research fields. Oropharyngeal squamous cell carcinomas (OSCCs) can be either Human papillomavirus (HPV)-positive or HPV-negative. Profiles of druggable Receptor Tyrosine Kinases (RTKs) are different in both groups, as shown in a paper by Cortelazzi, B. et al. The authors chose a cohort of 17 HPV-positive and 59 HVP-negative Formalin-Fixed OSCCs, in order to study E5 expression and RTK alterations. RTK activation was explored in further 12 Frozen OSCCs. Mechanisms leading to cellulite formation is complex. It involves lipid regulatory pathways and proinflammatory cross-talk that represent promising molecular targets in cosmetology. This post introduces a clever in vitro adipocyte-based assay targeting adipocytokines to better determine the anti cellulite effects of cosmetics compounds. In our series of posts on different signaling pathways, let’s take a look today on Notch and its relevance in Acute Renal Failure (ARF). A recent paper by Gupta et al. elucidated the role of the Notch pathway in kidney regeneration. This paper means an advance towards understanding potential therapeutic targeting of Notch signaling to enhance renal repair. Activation of the Notch pathway occurs following ARF. Pretreatment with the Notch ligand DLL4 enhanced recovery from ARF and represents a potential novel therapeutic option for regenerating the injured kidney. Anti-Notch 1 (Cleaved N terminal) (Human specific) (RABBIT) Antibody (Cat. No. 039100-401-407). However, compared to previous publications, as the authors mention in the paper, the use of different antibodies can affect the overall result of the experiment (as we all know!). In this specific case, Gupta et al. demonstrated increased expression of cleaved Notch1 and cleaved Notch2 as early as 1 h following reperfusion after 45 min of ischemia, and their findings are consistent with studies by Kobayashi et al. in a similar model of ARF with a few exceptions. The paper by Kobayashi showed increased mRNA and protein expression of Delta-1, cleaved Notch2 only, while cleaved Notch1 was minimally detected under basal conditions or following injury. However, Gupta used the cleaved Notch-1 antibody from Rockland (see figure), and detected a robust signal for cleaved Notch1 with increased expression seen as early as 1 h following injury. These results were confirmed by immunohistochemistry using the Val1744 antibody. Therefore, both Notch1 and Notch2 are activated in the kidney following ARF. Notch signaling has many roles, from neuronal function and development to the expansion of the hematopoietic stem cell compartment during bone development. Notch signaling pathways are a booming area of pharmacological research, due largely to the direct connection to human disease intervention. Figure taken from Ref. 1. Extracellular vesicles in general, or exosomes in particular, are becoming a hot topic for research, especially in cancer. They seem to have different roles in tumour progression or can be used as targets to develop new therapies. In our series of posts on exosomes, we will focus today on their role in signal transduction. 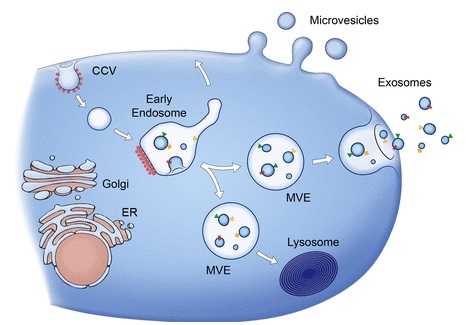 Release of microvesicles and exosomes (taken from Ref. 2). The Transient Receptor Potential (TRP) ion channel family participates in numerous functions of the Nervous System. A recent publication tends to indicate that TRP might also be of interest for therapeutical strategies for controlling pro-inflammatory CD4+ T cell reactions. We all react to external factors, even the most cold-blooded person. We might hide our emotions, but there they are. The same happens in cancer. Cells (both the tumour cells and the normal ones) react to the environment in one direction or another. In this post, we will see how “kinome” analysis might help Researchers in better understanding cellular interactions in tumour microenvironment (TME). IP3-mediated STIM1 oligomerization requires intact mitochondrial Ca2+ uptake by Deak et al. Deak AT et al. decipher the mechanisms by which mitochondria contribute to Ca2+ intracellular signaling. In their recent paper (1), they show that mitochondrial “Ca2+ buffering” close to the Endoplasmic Reticulum predominately shapes cytosolic Ca2+ micro-domains. To perform their studies, the authors used stable knock-down (KD) HeLa cellular models optimized for loss-of-function analysis. Finally, the authors present two diagrams illustrating the role of mitochondrial Ca2+ uptake for Stromal Interacting Molecule 1 (STIM1) oligomerization and Store-Operated Ca2+ Entry (SOCE) maintainance in their HeLa cellular models.